Perhaps the primary reason advanced by "kingdom now" theologians in their attempt to equate God's present work in the church with a present manifestation of the Messianic kingdom is that following His Ascension, Christ supposedly took His seat on David's Throne in heaven. From this regal position He now orchestrates the spiritual kingdom through the church. However, it is better to reject the notion that the Davidic Kingdom is present in any sense today and instead to maintain that this kingdom will not be inaugurated until the millennial age. At least six reasons support this conclusion. First, we noted that the Old Testament consistently depicts the Davidic Throne in terrestrial rather than celestial terms. 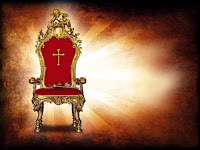 Second, we noted that because of this scriptural portrayal of the Davidic Throne, to argue that the Davidic Throne is now manifesting itself in this age from heaven is to contort the notions of progress of revelation and literal or normal, grammatical, historical hermeneutics. Third, no New Testament verse or passage, including those frequently appealed to in early Acts, clearly puts Christ on David's Throne in the present age. Fourth, the prophet Daniel made it clear that the Davidic, Messianic kingdom could not come until the kingdoms of man had run their course (Dan. 2; 7). Unfortunately, kingdom now theologians ignore this chronology by arguing for a present, spiritual form of the kingdom despite the fact that the kingdoms of man have not yet run their course, the Antichrist and his kingdom have not yet been overthrown, and the Second Advent has not yet occurred. Fifth, because the church is an unrevealed mystery to the Old Testament writers (Eph 3:9), it is wholly unrelated to the Davidic Covenant and Kingdom. Sixth, God's present work through the church can best be described as a parenthesis or interlude in between God's past work with Israel (the first 69 weeks of Daniel's prophecy of the Seventy Weeks) and God's future work with Israel (the 70th week). Because the Davidic Covenant and Kingdom specifically concerns Israel rather than the church, the Davidic Covenant and Kingdom could not be fulfilled in any sense during the present Church Age. Charles Ryrie, Dispensationalism (Chicago: Moody, 1995), 178. Stephen Nichols, "The Dispensational Vew of the Davidic Kingdom: A Response to Progressive Dispensationalism," in The Master's Perspective on Biblical Prophecy , ed. Mayue and Thomas, Master's Perspective Series (Grand Rapids: Kregel, 2002), 54. Stephen Nichols, "The Dispesnational View of the Kingdom: A Response to Progressive Dispensationalism," The Master's Seminary Journal 7 (Fall 1996): 238. Robert Lightner, Last Days Handbook (Nashville: Nelson, 1997), 211. Alva J. McClain, The Greatness of the Kingdom (Grand Rapids: Zondervan, 1959), 424-26. Stanley D. Toussaint, "Israel and the Church of a Traditional Dispensationalist," in Three Central Issues in Contemporary Dispensationalism , ed. Herbert W. Bateman (Grand Rapids: Kregel, 1999), 242.